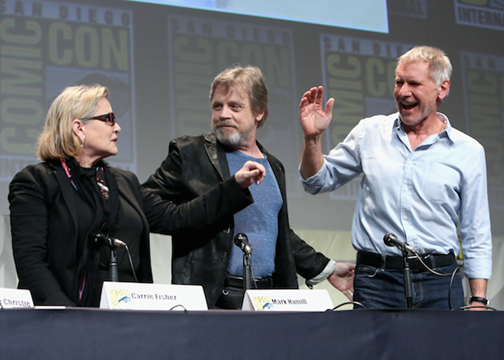 In Hall H, more than 6000 fans were treated to a behind the scenes look at STAR WARS: THE FORCE AWAKENS by Director J.J. Abrams, Producer & Lucasfilm President Kathleen Kennedy, and Writer Lawrence Kasdan. The filmmakers were joined on stage by cast members Daisy Ridley, John Boyega, Adam Driver, Oscar Isaac, Domhnall Gleeson, Gwendoline Christie, Mark Hamill, Carrie Fisher and Harrison Ford to the surprise and delight of those in attendance. Bet you wish you were there when this was all going down, right? I am completely jealous because I am a big time Harrison Ford fan. Ah, maybe someday I will get to meet him. (Putting that out there to the Star Wars Universe). 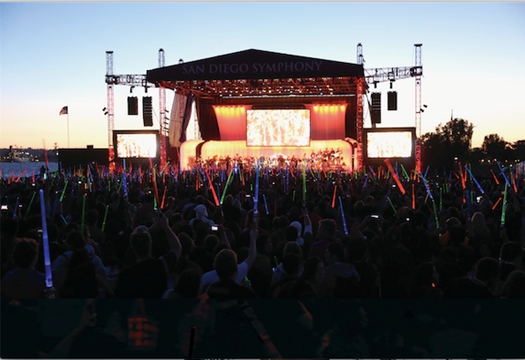 At the end of the presentation, all of the fans were invited to continue the celebration and join cast & filmmakers at a surprise Star Wars Fan Concert. 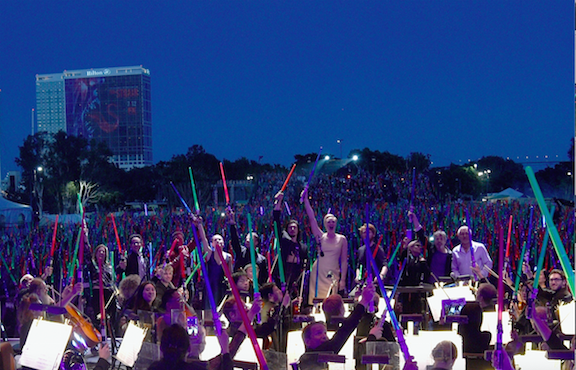 The San Diego Symphony performed the classic Star Wars music from John Williams at the Embarcadero Marina Park South. Did I ever tell you we played Star Wars music once in my high school orchestra? (Star Trek too, but that’s besides the point). I played the flute and was section leader of the Piccolo, so I’m pretty sure I had some sort of solo at one point. I think it would have been amazing to watch this in person, as someone who could truly appreciate the musicality of it all. And for those of us not blessed to see this all, we still have the movie to look forward to. STAR WARS: THE FORCE AWAKENS arrives in theaters everywhere on December 18th! I was not compensated for this post. Photo credits to Marshall and his friends from Disney.